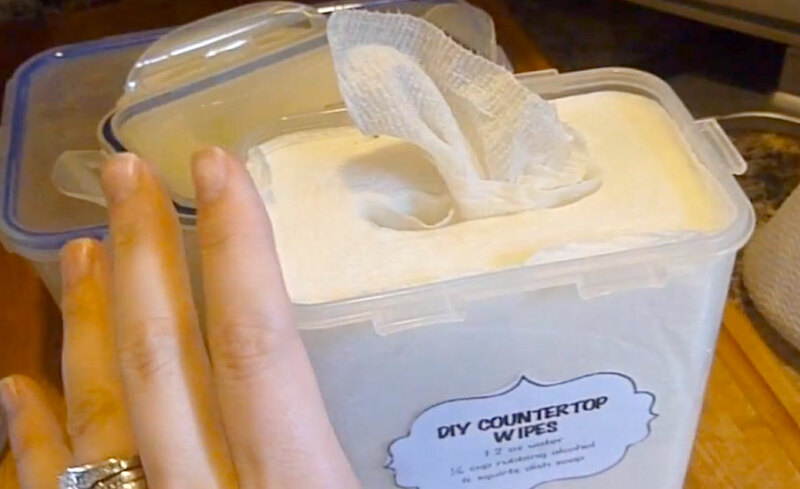 Disposable disinfectant wipes are essential for me since I cook a lot and having them handy is a great convenience, but you can end up spending extra when you purchase them from the store. If you love cooking like me, you understand that maintaining a clean kitchen can be tough when your hands are busy cooking food. It’s essential to wipe down and disinfect cutting boards, counter tops and any other surfaces where you are prepping food. The last thing anyone wants is to get food poisoning or sick because of food coming into contact with germs and bacteria. It’s a hassle to wash your hands, grab a bottle, get a paper towel, spray surfaces and wipe them clean. That’s why many people use convenient, quick, and easy Lysol disinfectant wipes. However, the problem with those is that they are expensive and contain lots of chemicals that you don’t want to ingest. A better alternative, that is more cost effective, is to make your own pre-soaked paper towel wipes with a non-toxic solution.